Philippine Tourism : Could an extreme makeover of the country's tourism image be in order? I came across an article the other day quoting Philippine Tourism officials as saying that the target for tourism arrivals is being increased from 8.5m to 10m annually andmy first impression was — huh? that’s a big number, Philippines Tourism must be doing better than I thought. I assumed the numbers applied to 2012 or 2013, something like that, and I was impressed because last time I checked in on this topic it was the late 90’s and Philippine tourism was hovering around 4m arrivals a year compared to 13m for Thailand (just to give a sense of the difference), plus more than 75% of the Philippine arrivals were balikbayans, so the number of non Balikbayan arrivals was actually more like 1.3m. I was in the tourism business back then, at Subic Bay Freeport, and I was frustrated: I felt that the Philippines was really not getting its fair share of tourists, and tourism promotion wasn’t getting the job done effectively. So — talk of 10m arrivals got my blood flowing and rekindled my pipe dream of owning a small fishing and diving resort somewhere in the Visayas. Anyway, to get anywhere near 10m in 5 years it will require a very serious commitment from the national government; plus a very sophisticated and effective series of campaigns that use both mainstream and social media. The good news is — the Philippines is well equipped to mount such a campaign because it has the best media professionals in Asia–great directors, cinematographers; it’s got plenty of great creative professionals at the ad agencies; it’s got a Tourism Secretary, Ramon Jimenez, who comes from the world of advertising and had a hand in successful brands like Jollibee; and finally Filipinos adept at social media are scattered all over the world and, if properly mobilized, could provide a digital grassroots component that could really make a difference. With my enthusiasm returning, I started looking online for Philippines tourism commercials, hoping to find something great. That’s pretty cool and is alot better for international than the last one I saw — “Kay ganda sa Pilipinas”. I rummaged around a bit more and found some variants that I liked as much or more. Here’s one. I then started looking for videos and commercials and was a bit disappointed at how hard it was to find them. But here is the official compilation of what I believe to be current Philippine tourism videos. — a number of them put together on one clip. I have to say — with all respect, I found that to be pretty disappointing on a number of levels. Technically, it’s very compressed and looks like videos looked in about 2002 — I’m sure the original material is much better but in the process of posting it on the web, it’s been mucked up. Also — why in the world do they have those ad agency countdowns on the head of each clip? Those are not meant to be shown — it’s for the TV station you’re broadcasting on to cue it up. It’s not for consumers to see. But the larger problem, it seems to me (and I am offering these thoughts in a sincere spirit of wanting to be helpful, not mindlessly critical) is that it’s just flat flat flat. There’s no life to it. I think the jingle is … well, it’s not that it’s bad. But there are so many great songwriters (and jingle writers) in the Philippines who can get a great OPM type melody injected into even a 30 second spot…..this is bright and cheerful with a hint of exoticness in it — but it goes nowhere and there’s no emotional value. I’m not saying I hate it — but it doesn’t do justice to what the Philippines has to offer. All of these are, I’m afraid, a lot stronger than the Philippine commercials. The Bahamas and Jamaica ones have great music that helps with the branding (and by the way Jamaica is a complete “re-brand” which became necessary in the late 80’s/early 90’s when there were security issues in that country). One thing they all have in common is that they focus intensely not only on the natural beauty — but they draw the viewer in and showcase both the effect the experience is having on the tourist (which is largely absent from the Philippine commercial) and the welcoming nature of the local population. This last thing is particularly frustrating because nobody is more welcoming than Filipinos, and this is a major tourism asset that’s not getting showcased in the commercials. The other thing that really jumps out is — just as Jamaica has charismatic world champion athlete in Hussein Bolt, the Philippines has a mega charismatic world champion athlete in Manny Pacquiao. He is a natural ambassador for tourism but he’s not being used. Manny Pacquiao is the greatest single tourism generating asset the Philppines has, and he should be used. The way he’s used could be simple and clever — look at the Hussein Bolt Jamaica video. He only appears at the very end, but the whole video is built around his “Lightning Bolt” imagery. The pride that the Jamaicans feel; the playfulness; all of that goes with the beauty of the backdrop. The solution to this is already out there — Jim Paredes “Handog Ng Pilipinas Sa Mundo” is everything this jingle isn’t, perhaps with new words in English — but that’s the melody, that’s the vibe — the heart and soul and warmth and inclusiveness of the Philippines is magically on display in that song. If you don’t know the song, here it is. It’s awesome an it captures the Filipino spirit in ways the current jingle doesn’t even begin to. And the “handog” of the Philippines to the world in the commercial I’m thinking of would be Manny Pacquiao’s smile; morphing into the smile of all Filipinos. The Philippines has GREAT ad agencies and GREAT commercial directors. There’s no reason the Philippines shouldn’t have a killer commercial that is the envy of every other island country out there. The key to it is to not just shoot the tourism attractions — shoot people in the foreground having the time of their lives, interacting with Filipinos with the natural beauty as the backdrop — not the direct focus of the commercial. With the “Handog” music; with a little Manny Pacquiao sprinkled in (especially his smile); and with Filipinos featured in a welcoming way — such a commercial would be much, much stronger than what’s online now. The videos that have been made are offered in very compressed, low quality on the Department of Tourism website and on Youtube. HD and SD versions should be put out and the poor quality ones should be taken down and burned. While they’re at it, could they please do a makeover of the Department of Tourism Website? The DOT website is really, really old fashioned and appears to have been designed using Microsoft Front Page ca 2002. It needs a facelift that makes more use of multi-media, has better navigation and just a lot more “sparkle”. 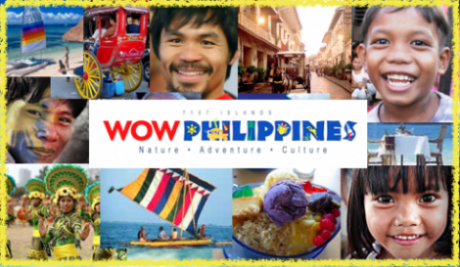 I would note that the official URL for the DOT is http://tourism.gov.ph while the “wowphilippines” site at http://wowphilippines.com.ph simply forwards to the official site. An alternative would be to make the wowphilippines site a consumer/social media/site, separate from the official sit, which presumably has to be more dignified and less flashy. Get cracking with social media! This is the magic bullet — use Filipino bloggers to help mobilize Filipinos around the world to support the “digital grassroots” effort, and also get tourists who go to the Philippines to share their experience and become proponents. Use new media to do this — perhaps sponsor online festivals of films and videos made by tourists visiting the Philippines (especially in the adventure segment, as they are web savvy and make a lot of videos anyway). All right, this turned out to be a longer post than I intended. I would really like to see something good happen with Philippine Tourism, and I’m going to help as much as I can from here, starting by creating a category on the site for travel stories and discussion of this issue. One small voice, but hoefully it will aggregate with others in such a way as to be helpful. Mabuhay ang Pilipinas!